Home / Inspire / Invest In Yourself. How do You Spend Your Time? Invest In Yourself. How do You Spend Your Time? See, whatever you are doing, however you spend your time, that tells you who you are. So think about what it is you like to create in your life experience. Once I look at how you commuter your time, once I do anything evaluation on how you spend your time, I cantik tell you exactly what you are commited to. How much time do you spend working on you? How much time do you spend everyday working on your dream? And the last go days, how many books have you read? And the last year, what new skill or knowledge have you acquired? 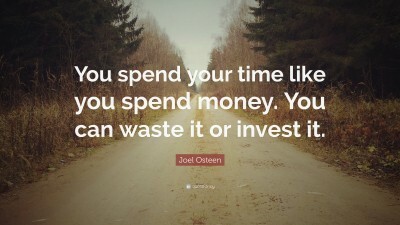 What kind of Investment have you Made in you? A lot of people as soon as they punch out, they rush home to sit on the couch. They rushed home to do nothing. They rush home just to sit there and future out, "Okay, I'm going to go sleep, do it all tomorrow." You have to give everything you've got. No more TV, no more parties, no more plan. If you have a 4.0, what you need to be doing is to study. This is a life class, that means that we have an opportunity to learn how to maximize our lives. Think of the things that you're doing, that somebody else could be doing. And think of yourself as a precious commodity that you are going to reserve your energy for your highest and best use. All the successful people have the exact same amount of time that you have each day. So what did they do that you may not be doing? They invested in themselves on the weekends, after work on evening. They put time on something that they wanted to do. They invested their own timing themselves. We are busier than any other generation. We have seen on the last three to four hundread years. We are just as busy as we can be and we think because we're busy, we're effective. But I want you to challenge your schedule for a minute and ask yourself, are you, are you really effective? Or is your life cluttered with all Linda of stuff that demand you and drains you and taxes you and stops you from bring your highest and best self and are you substituting business and all the chaos that goes along with business from being effective? It takes time to be creative. You we're meant to be creative. You we're created on the likeness and the image of a creator, and on the likeness of in that image, you have creativity. If you had time, you would be creative. The most important thing is to value our time. So, what are you going to do with this time? How much of it do you think you've already used up? What are you gonna do today?